Does your social media posting schedule feel like a chaotic mess? Would you like a social media calendar template to help you stay organized, effective, and efficient? You probably want to keep your social media profiles full of great content, while maintaining a balanced mix of content types. And you must know how easy it is to lose sight of your social media goals and slip into a post… post… post speed race. 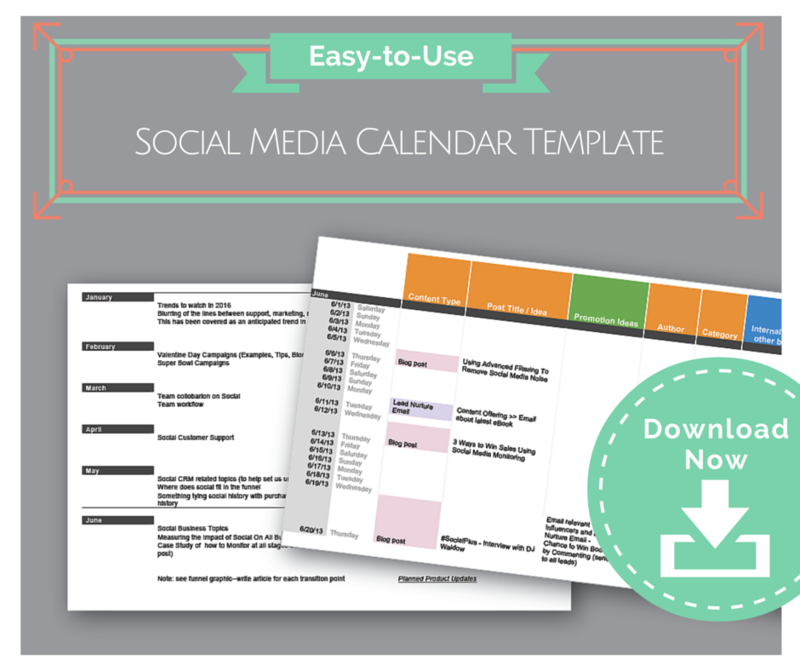 Here’s the bottom line: A social media calendar template will keep you on track. It’ll help you follow a well-thought-out plan. The downloadable template contains easy-to-use tabs for your editorial themes, posting calendar, and bulk uploads for quick mass posting. Most businesses have some type of annual or seasonal cycles. Keep these annual themes on your calendar so they don’t sneak up on you. These should include major holiday promotions, conferences, events, sales, or product promotions. Holidays such as Halloween, Valentine’s day, Hanukkah, or Christmas. Major sales days such as an Annual Anniversary sale, or Black Friday. Events such as industry conferences or your company’s own customer conferences. Product launches such as the Fall Fashion release or annual product updates. The tab you’re going to probably be spending most of your time on is the posting calendar. Once you’ve got your posts created (and approved) in your social media calendar, the rest is easy. All, you need to do now is import them into a social media marketing tool to schedule them. As a bonus, we’ve included a format that can be used to create an easily upload posts to the Rignite social media management platform. Set the status of imported posts to Draft, Paused or Scheduled. This is a nifty workflow for teams. Use the Draft status if you want to work on them later in Rignite, or if an intern is uploading them and you need to review them. You could also use the Pause status to put them on your calendar in a paused state until you or a team member releases them. If you’d like to use it, save it as a CSV file before uploading to your Rignite account. To get a template for our bulk upload post scheduling feature, download it from your Rignite account, or contact Rignite for a CSV formatted example. Rignite is a software solution that makes it easy to get results from social media marketing. We make it easy to post, schedule, collaborate, and track results of your social marketing. This downloadable social media calendar template will keep you focused on your objectives and give you the big picture. So you won’t get lost in the daily grind. We’ve used sample screen-shots and formatted fields, including some from the Rignite social media marketing platform. You can sign up for a free trial of Rignite here to try these features out for yourself. Download the template today! It provides a valuable way to plan out your editorial calendar in advance to keep your social media content plan on track.